In a number of articles I've covered how to use GAS for jsonp, oauth, as a lockbox and various other useful things. There are many threads to pull together in this section, so here's a step by guide to GAS proxying as described in this post. We will cover 2 examples in this guide, then show how to access them from a variety of external sources. Retrieving some data by parameter from an Apps Script ScripDB, and returning a jSon response. Most of the code that is referred to in these serious of posts is available in the mcpher shared library. Please add this library to all any scripts you create. Create a blank script project, pubstuff, and add the mcpher library. See Using the mcpher library in your code. Create a second script project, storeinscriptdb, and add the mcpher library. See Using the mcpher library in your code. In storeinscriptdb, create a module to store some data that we will retrieve later. See Store data in scriptdb for how. Now we can put the whole thing together. Using the url of your published app from pubstuff, which you created in Hosting your public scriptdb, you can now enter that in a browser with a parameter of ?entry=favorites appended to the Url. You should get a result like that from my implementation of this step by step so far. "reason": "favorites found in your stuff"
Most of the code that is referred to in these serious of posts is available in the mcpher shared library. Please add this library to all any scripts you create. In this example, we are going to take the urbarama mashup, which already uses google apps script to combine 2 APIS, and create another API which refines the result of that and returns the refined results. Create a blank script project, urbenhanced, and add the mcpher library. See Using the mcpher library in your code. in urbenhanced, we need to write some code that will execute the original urbabarama mashup as rest query, but will manipulate the results and publish the manipulated results instead. See Enhancing the urbarama mashup for how. Now we have an enhanced urbarama mashup. Here's my implementation of this example with a couple of parameters appended. 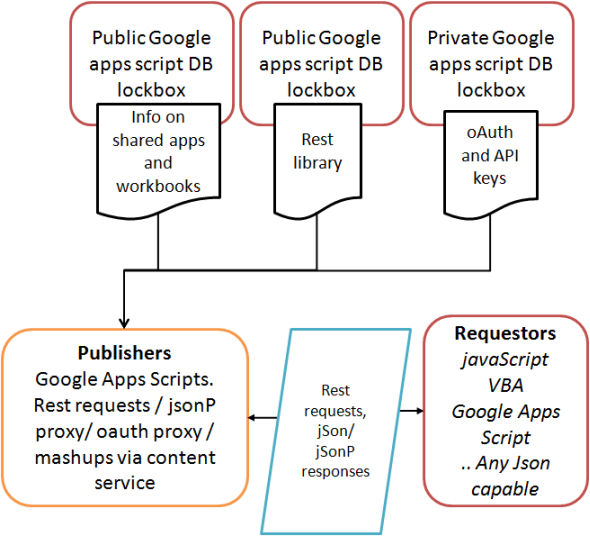 Now that we have a couple of publishers, the next step is to use the scriptDB to store an accessible version of your growing library of published apps. For help and more information join our forum,follow the blog or follow me on twitter . Now take a look at some selected detail in some of these topics.